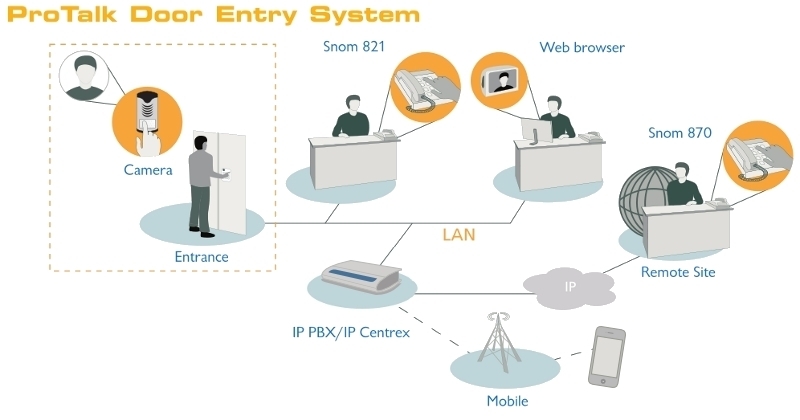 The ProTalk IP Door Entry systems are designed for outside use and connect with most SIP based IP PBXs and hosted telephony services. - view full list of compatible PBXs and Hosted VoIP platforms. The unit has a stylish finish that will fit into any environment with the option of flush or surface mounting. The unit is easy installation for outdoor or indoor use. When a visitor presses a button you can identify them by speaking and seeing them via an IP phone like a snom 821 or via the free pop-up software that will display the video image on a PC monitor. Find out more information on video integration. There is also a choice of Flush mount or Surface mount installation boxes. The Cityline also has the ability to program a combination lock using the two buttons, allowing authorised personnel to gain access by entering the specified code via the two buttons. Weather resistance, this mean the unit will not show the signs of ageing over time. Volume control to adjust the conversation level. Includes a highly sensitive CCD Camera with 3.7mm lens. Push buttons include a card slot to insert a label with the extension details for example flat number, business name or logos. The push buttons are permanently lit for use in the dark. Opening time is adjustable from the keypad. PoE or 12V power supply.